Where’s Samuel Jackson when you need him? Passengers on a flight to Mexico City were startled recently when a snake slipped out of the overhead compartment. The snake apparently hopped on board during before taking off from Torreon in the northern state of Coahuila. The snake was a five-foot-long green tree viber, which is extremely venomous. It’s poison will likely not kill a person, but can leave to severe necrosis. 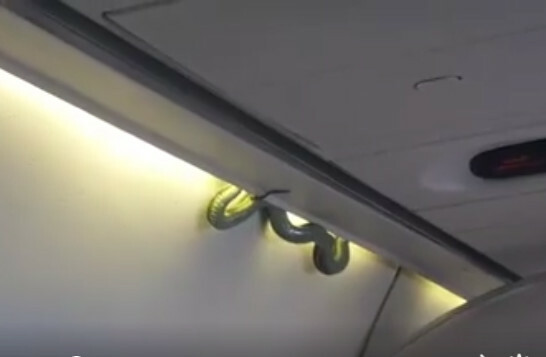 In the video, the snake is seen crawling from a crack between the overhead bin and the fuselage and then falling into the seat below, but there no more details on exactly it was handled. Luckily, there weren’t any others. next articleConvert a ’74 Caddy into a 4×4? Why Not?